A while ago I built a new work PC. I installed a then new AMD Piledriver 8-core processor, 16gb of 1600ram, a Radeon video card and a Microcenter 128GB SSD drive. I wanted it to be fast and do all of the thing I need for work plus a little 'net surfing when time allows. Well this weekend I'm working at one of my group homes to fill in for an MIA staff member. I figured since I'll have some time on my hands after the guys go to sleep I'd take my CF amp, Stax phones and some of my fav CDs/DVDs and give this setup a listen. I gotta tell you it's pretty damn nice. I'm running the Hammond EL84s and vintage Shuogong(sp) 6AX7s I bought at VHoP last year. I've overclocked the processor a bit, more with a bent toward work document processing. I'm running an ASUS XONAR Essence STX sound card. I really like this combo. The ASUS doesn't have the balls to drive the Stax 'phones, enter the modded CFamp. Right now I'm listening to Mark's CF09 disc, but yeaterday I was digging a pirated copy of Joan Baez' Diamonds and Rust and Lonnie Johnson/Elmer Snowden George Daniel turned me on to several Fests ago. Later I plan on giving Mileage Gilbert's 3 Faces, DSOTM, and Holly Cole a turn. For those of you who may be night-owls or want to listen and not bother the family and have a CF amp sitting around give some Stax 'phones a listen. I may give the V20 a listen in this configuration when I get home. Looks like it happened George! What was the amp mod? Are you gonna bring it to the fest? I'm trapped at work revising documents for August. We passed our compliance survey but I have a few changes to work on. Tonight I've run my Sansa Disk MP3 player, mostly 'cause it's got 1700+ songs on it. Right now it's Bryan Adams. All things considered....not to bad, I've heard Bela Fleck, Bananarama, Celtic Women, and TheBoss. There are worse things to do when you're stuck at work. BTW, I've been exercising the grill with some steaks, chicken, dogs and ribs. This is my last night at work before I load up and go home and after getting all of my ducks in a row here I got to spend a little more time with the Stax/CFamp combo. 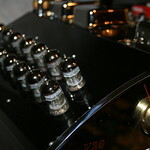 At this moment I'm running a quad of 1963 Telefunken EL84s, these are great tubes! While I like the Hammonds better, the Teles are a bit more lush and detailed in the midrange seemingly giving up some bass extension to get it. I went to the library and borrowed some CDs, brought them back for a listen before my guys returned from work. Bob Dylan's 'Desire' is a record I've always loved and know by heart. This rig brings him very close to the listener. I swear I could hear a little tape hiss from the analogue master low in the background. Next up was Grand Funk Railroad's 'Born to Die'. I've been a huge GFR fan since I was a teenager and I'm really fond of this recording. It has the right amount of ambiance around the musicians, it has alot of what I like to hear. I noticed a slight halo of echo around Mark Farner as he sang. After I finished GFR a copy of DSOTM I recorded on my Tascam from a 180gm master disc. I have a real soft spot for Triumph, something about them just clicks for me. I found a copy of 'Classics' and let 'Magic Power' roll over me in waves. Discovering 'live' music on the web I ran onto Ozzie playing in Philly during the '90s. Good show and the sound wasn't all that hateful either. I found Queensrieche's 'Jet City Woman', love that song too. All of this sounds pretty good. Not bad for free. Real men use speakers Ray. He men use big speakers...not earspeakers! radioeng2 wrote: Real men use speakers Ray. He men use big speakers...not earspeakers!